I have found type exciting since I was a child. I used to love going to the sweetshop after school to look at all the brightly coloured lettering on the packaging and I would go home and make my own versions. Then later my schoolbooks were covered in meticulously redrawn logos of my favourite bands and song titles. These early experiences inspired my interest in the expressive qualities of type and I wrote Why Fonts Matter to share this. 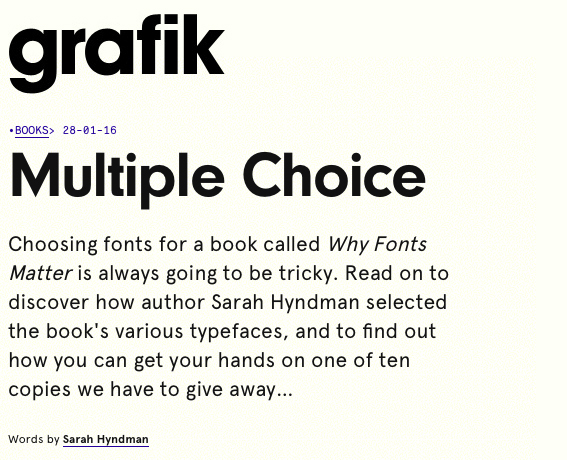 Read the full article and find out how to enter the competition to win a copy of Why Fonts Matter here.